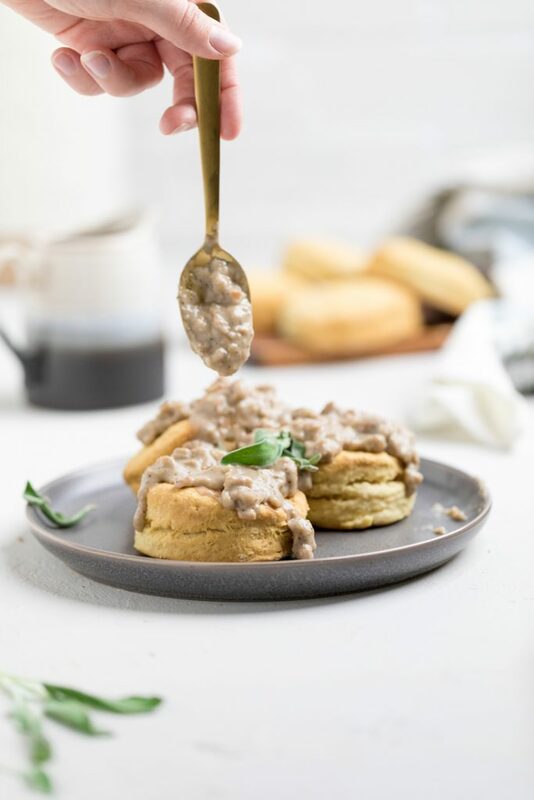 Top the best dairy free homemade flaky, buttermilk biscuits with absolutely amazing vegan sausage gravy for the ultimate Southern style vegan sausage gravy and biscuits. What if I told you that you can still make the ultimate Southern breakfast but it be completely vegan? 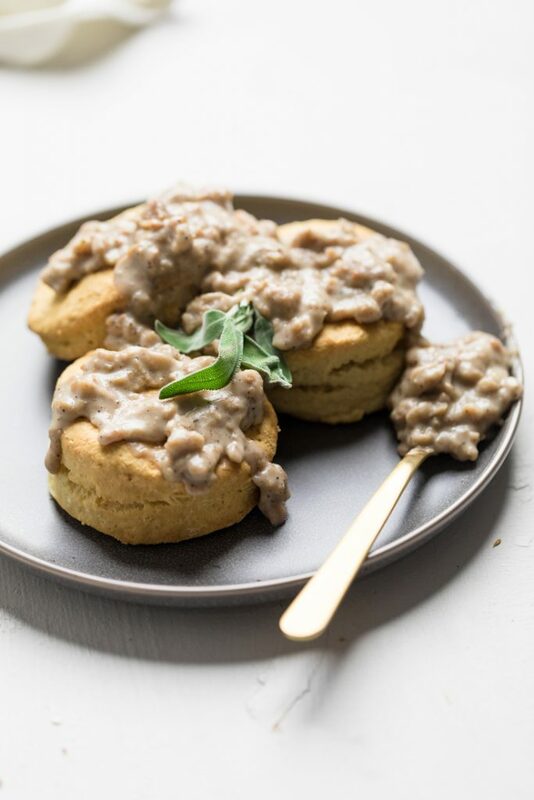 Whether you are vegan, or only dairy or egg free, you may be excited to know that yes, indeed, you really can make an absolutely delicious vegan biscuits and gravy recipe. 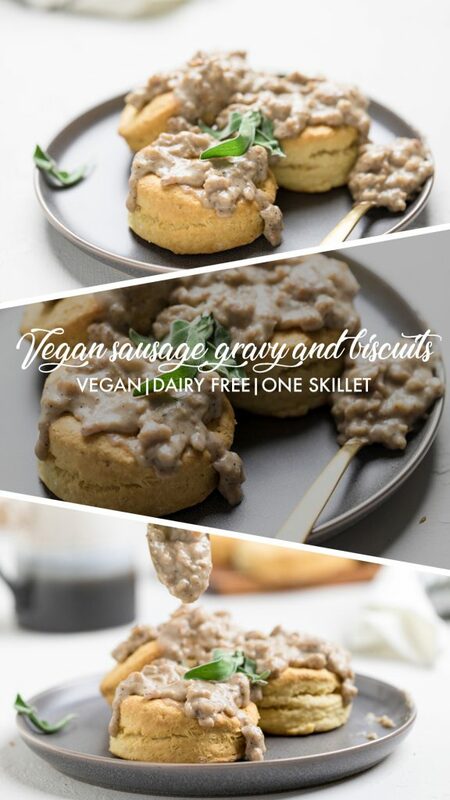 This recipe combines our insanely soft and flakey homemade dairy free buttermilk biscuits with a creamy and perfectly savory vegan sausage gravy. This is one of those recipes that is going to be on repeat around your house. What ingredients to you need to make vegan sausage gravy and biscuits? For the biscuits, you will need our homemade dairy free biscuits. How do you make vegan sausage gravy and biscuits? 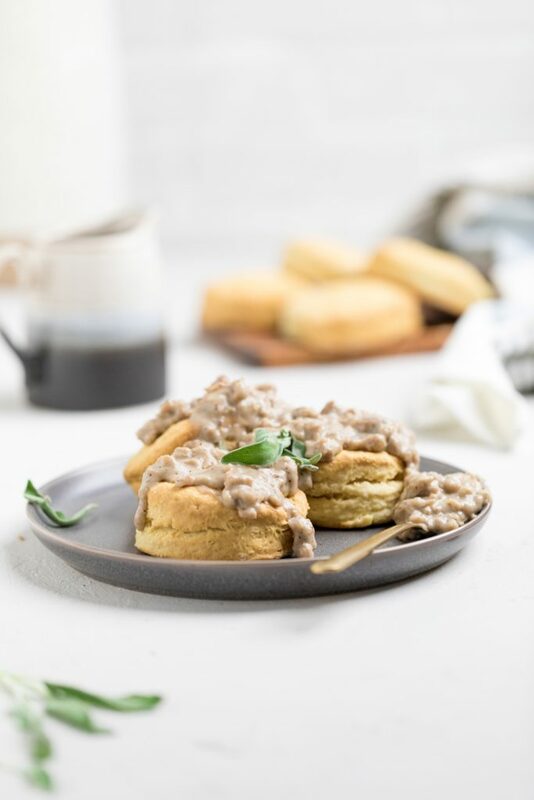 This homemade dairy free biscuits and gravy recipe comes together in under 30 minutes which means it’s the perfect breakfast meal any day of the week. 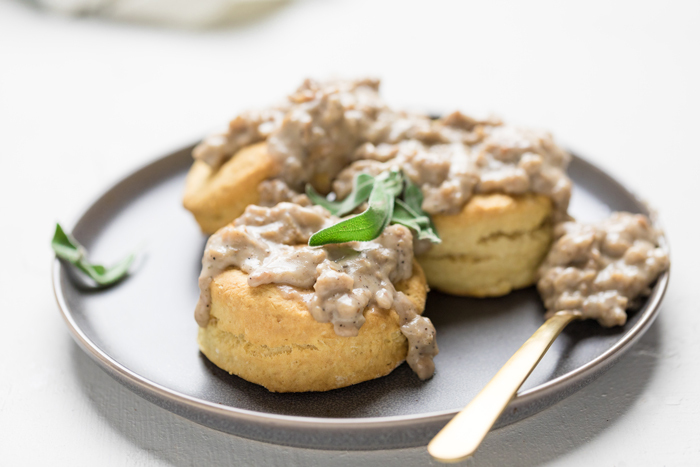 To start making this homemade vegan biscuits and gravy, you are going to want to make the biscuits. We highly recommend that you make our homemade dairy free biscuits that are included in the total 30 minute timeframe. Once you have the biscuits in the oven cooking you can get started on the vegan sausage gravy. Start by melted butter in a large skillet. We love using a cast iron skillet for this meal. Once the butter is melted, add in your vegan sausage. We find it best to break into small pieces. You are then going to brown your sausage, all while crumbling up the mixture to smaller crumbles. After about 5 minutes, you are going to add your dried sage and stir together. The sage gives it a more savory and earthy tones that are typical of a lot of non-vegan breakfast sausages. If you find and use a vegan breakfast sausage that already has sage you can omit this step. Next, sprinkle half the flour over the sausage and combine. Then do the other half. Mix well until you see no more flour. Then, add the milk, one cup and a time, stirring after each cup. Finally, let cook, stirring frequently, for 10-15 minutes. It will thicken up during this time. Add in salt and pepper to taste. Depending on the sausage that you use, will really determine the salt you need to add as some prepackaged sausage has a lot of sodium already added to it. Remove from the heat and serve over the warmed homemade vegan biscuits that you made. Store any leftovers in the fridge. Where can I buy vegan sausage? We have found vegan at a variety of stores. Whole Foods and Wegmans, as well as local grocery stores, like Shoprite and Acme. At the local grocery stores, it is in the section where tofu is located, usually in the produce department. I’m not vegan, can I use regular sausage? We know that not everyone reading our site is vegan, but rather dairy free for a number of reasons. If you still consume meat, you can swap out the vegan sausage for another sausage in the same amount and proceed with the recipe as called for. What are other dairy free breakfast recipes I should try? 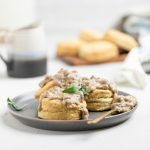 Is this a Top 8 Allergy Friendly sausage gravy and biscuits recipe? This recipe contains soy and wheat in the vegan sausage. The rest of the recipe can be Top 8 Allergy Friendly. If you are able to locate a vegan sausage that does not contain these two ingredients then it would be also. We have not found one ourselves, but will update if we do. Make the homemade vegan biscuits according to directions. Once biscuits are in the oven, melt the butter in a large skillet. Add in your vegan sausage, breaking into small pieces. Brown sausage, breaking the sausage into crumbles while cooking for 5 minutes. Add in dried sage and stir together. Sprinkle half the flour over the sausage and combine. Then do the other half. Mix well until you see no more flour. Then, add the milk, one cup and a time, stirring after each cup for 2 1/2 cups. Finally, let cook, stirring frequently, for 10-15 minutes. It will thicken up during this time. If you feel like it needs more milk add up to the remaining half a cup. **Please see notes in post about cooking this recipe.